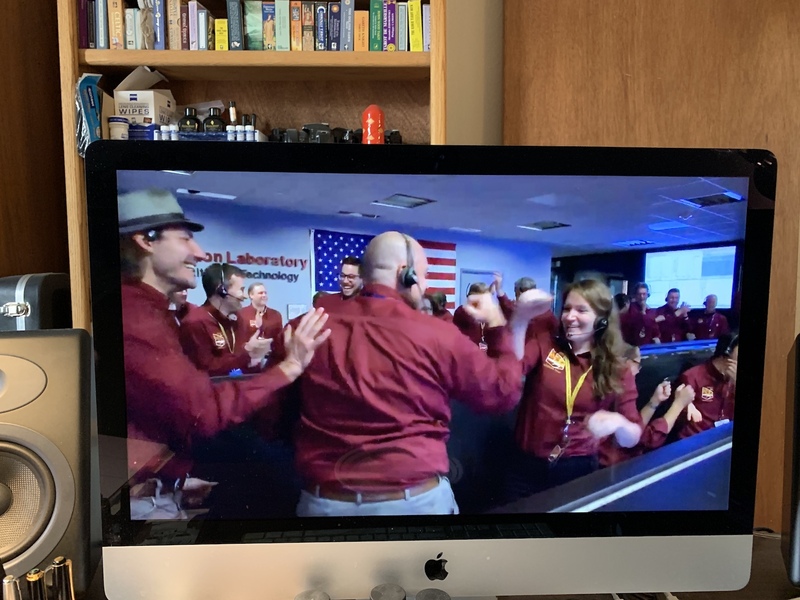 I watched the final few minutes of the Insight landing. It was successful. Decades ago I often rose early to watch launches of probes from Cape Canaveral. I recall watching video from the Apollo missions to the moon. I ate these events up, being fascinated by science and astronomy since I was very young. I never imagined that I would watch the scientists and engineers at Jet Propulsion Laboratory working on the landing of a geophysical probe on Mars — on my computer over the Internet. Yet, today at noon, I did just that. I watched the control room at JPL as they monitored the probe's entry of the Mars atmosphere and touchdown on the surface. I am still a little astounded by this. I never expected it. The probe is important. If the science is successful, it will gather data about the interior of Mars. It will be our first look at the interior of another planet. I have lived through an incredible series of events. I do not remember it, but Sputnik flew when I was young. I watched the Mercury missions, then the Gemini missions, then the Apollo missions, and the Shuttle missions. I have stepped out my back door and watched the International Space Station fly overhead, a bright, fast-moving star.